Directed by Connie Littlefield. "Long before Timothy Leary urged a generation to 'tune in, turn on and drop out,' LSD was used by researchers to understand the human mind. Discovered in 1943 by Swiss Chemist Albert Hofmann, LSD was hailed as a powerful tool to treat drug addiction and to provide a window into schizophrenia and other mental illnesses. While researchers were establishing the medical benefits of LSD, others -- like author Aldous Huxley -- promoted the drug as a powerful tool for mental exploration and self-understanding. Timothy Leary, Ralph Metzner and Ram Dass became heroes at Harvard after the university cancelled their research project into psychedelics. 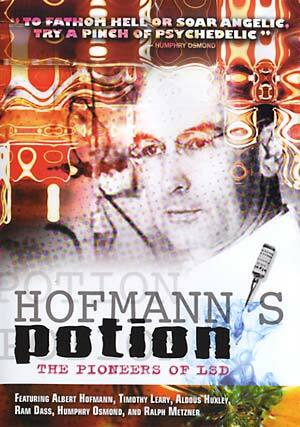 Featuring interviews with the pioneers of LSD, Hofmann's Potion is more than just a chronicle of the drug's evolution. It is an invitation to look at LSD -- and our world -- with a more enlightened mind." Featuring rare archival footage and interviews with the pioneers of LSD: Hofmann, Leary, Huxley, etc. Region 0 NTSC format, 56 minutes, color, aspect ratio: 4x3, stereo.